The play in five acts "Genpei Nunobiki no Taki" was originally written for the puppets theater in 1749 It was adapted for Kabuki in the 9th lunar month of 1757, produced by the zamoto Anegawa Daikichi I in Ôsaka at the Kado no Shibai (casting unknown). 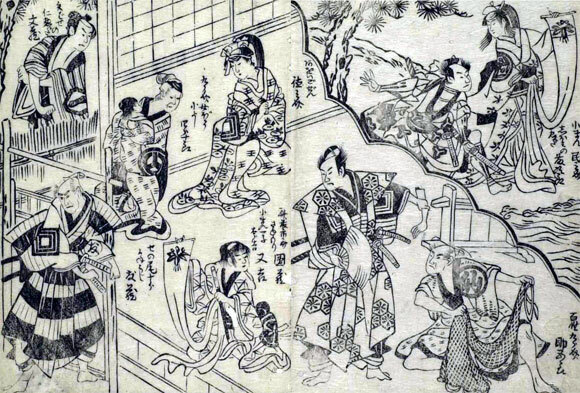 It was staged in Edo for the first time in the 1st lunar month of 1757 at the Moritaza. Heroes and events in "Genpei Nunobiki no Taki" were coming from two important takes: "Genpei Seisuiki" and "Heike Monogatari". "Genpei Nunobiki no Taki" was originally a 5-act drama. Osada Tarô Suemune, a Heike clansman, visits the Imperial Palace as a messenger from Taira no Kiyomori, head of the Heike Clan, to offer to Emperor Goshirakawa the severed head of the Genji general Minamoto no Yoshitomo and the white banner (shirohata) of the Genji Clan captured by Heike warriors. Dainagon Naritada, a court noble sympathetic with the Genji Clan, tells the messenger to bury the head with due respect. After Suemune's withdrawal, the Emperor calls Minamoto no Yoshikata, Yoshitomo's younger brother, and presents him with the white banner, advising him to raise an army anew to take his revenge on the Heike Clan. At this moment an unexpected visit of Kiyomori is announced and the Emperor retires to his curtained throne. Kiyomori tries to proceed to the throne but is interrupted by Yoshikata, who declares that Kiyomori is not high enough in his court rank to be granted an audience to the Emperor. As Kiyomori and Yoshikata start fighting, Naritada mediates and asks Kiyomori what he wishes to tell the Emperor. Kiyomori says he wants to protest against the Imperial command to bury Yoshitomo's head honorably instead of gibbeting it. He also demands that the white banner be returned to him. Naritada tells him that the banner has been burned by Imperial order. Angry at what he believes to be a downright lie, Kiyomori tries to run up the stairs leading to the throne when the curtain covering the throne is raised and Emperor Goshirakawa, red with anger, stares hard at him, causing him to fall in trepidation. Kiyomori declares that he will retaliate by confining the Emperor to his Toba detached palace. The scene is set in Settsu at the Nunobiki Falls. By order of Kiyomori, who has been told by a goddess in a dream that the fortune of the Heike Clan will be told by the witch living at the bottom of the Nunobiki Falls, the warrior Nanba Rokurô Tsunetoshi comes to the front of the waterfall. Taira no Shigemori, Taira no Kiyomori's son, also arrives, accompanied by Takahashi Hangan Nagatsune, to observe Tsunetoshi's actions. Soon after Tsunetoshi has dived into the waterfall basin an arrow apparently aimed at Shigemori swishes by him. Retainers of Shigemori soon arrest the archer and bring him to Shigemori. Nagatsune says that the would-be assassin is the Genji warrior Tada no Yukitsuna, in disguise of a hunter, but Shigemori magnanimously frees him. Presently Tsunetoshi comes back from the bottom of the waterfall basin to report that the witch is very angry at Kiyomori's arrogance. No sooner has he finished reporting than a tremendous thunder storm occurs probably an indication that the witch is displeased with Tsunetoshi's disclosure of her secret. --> A dedicated summary: "Yoshikata Saigo"
Yoshikata is living in his Kyôto mansion (yakata) with Aoi Gozen, his wife who is now pregnant, Matsuyoi, his daughter by his former marriage, and the yakko Orihei, his servant with whom Matsuyoi is in love. While Orihei is out on an errand, Kurosuke, a farmer, visits the mansion with Koman, his daughter, and Tarokichi, her son. Matsuyoi is shocked to learn that Koman and Tarokichi are respectively Orihei's long-separated wife and son. Advised by Aoi Gozen not to show any sign of anger, however, Matsuyoi calmly shows the visitors to the waiting room. When Orihei comes back Matsuyoi accuses him of his concealment of the fact that he has his wife and son. Yoshikata tells Matsuyoi to go to an inner room and asks Orihei about the result of his mission, which was to locate the house of a Genji warrior named Yukitsuna and deliver Yoshikata's letter to him. Orihei says that he could not find the house and returns to Yoshikata a box containing his letter. Yoshikata notices, however, that the box is unsealed. This is apparently an indication that someone has read the letter. Ever since Yoshikata employed Orihei as his servant, he has been suspecting that he is in fact Yukitsuna. When he sent Orihei on the errand to Yukitsuna's house, he was fully aware that there is no such house. The errand was merely his device to confirm that Orihei is none other than Yukitsuna. It was Orihei who has read the letter addressed to Yukitsuna. Asked about his identity, Orihei (in reality Yukitsuna) admits to Yoshikata that he is indeed Yukitsuna. While the two warriors are discussing how to take their revenge on the Heike Clan, Takahashi Hangan Nagatsune and Osada Tarô Suemune visit the house as Kiyomori's messengers to ask whether Yoshikata has the white banner of the Genji which Kiyomori has presented to the Emperor. As Yoshikata denies any knowledge of the white banner Suemune, commanded by Nagatsune, takes Yoshitomo's skull out of a box and orders Yoshikata to kick it as a proof of his loyalty to Kiyomori. In a subsequent fight Yoshikata throws Suemune and Nagatsune. When Yukitsuna joins the fight by drawing his sword Nagatsune flees helter-skelter. Suemune is, however, killed by Yukitsuna, who beats his head with Yoshitomo's skull to crush it to pieces. At Yoshikata's suggestion, Yukitsuna and Matsuyoi leave for the Toba detached palace to rescue the confined Emperor. Soon a Heike unit headed by Shinno Jirô Munemasa appears to attack Yoshikata. Yoshikata delivers the white banner to Aoi Gozen and advises her to flee, but Yokota Heinai, Munemasa retainer, wrests the white banner from her. Yoshikata recovers it from Heinai and subdues Heinai and his comrade Gunzô. After Kurosuke has fled with Aoi Gozen and Tarokichi to safety, Yoshikata hands the banner to Koman and asks her to follow them. In a desperate effort to arrest Yoshikata, Munemasa holds him from behind, Yoshikata, who has made up his mind to kill himself, thrusts his sword so deeply into his abdomen that the sword pierces Munemasa's abdomen as well. The michiyuki with Aoi Gozen, Kurosuke and Tarokichi, traveling to Onohara village in the province of Ômi. --> A dedicated summary: "Yabase no Ura"
Carrying the white banner concealed in her kimono, Koman arrives at the beach of Yabase Bay when Shiomi no Chûta and other Heike warriors overtake her and try to wrest the banner from her. Koman valiantly fights them off with a show of unwomanly strength but at last it seems impossible for her to resist the attack any longer. So she jumps into Lake Biwa in order to prevent the banner from falling into enemy hands. --> A dedicated summary: "Kojô"
Returning from a visit to the shrine on Chikubu Island on Lake Biwa, Taira no Munemori, son of the head of the Heike Clan, is on board a luxurious boat (gozabune) heading for the Shiga beach. Beside him is Hida Saemon, one of his retainers. Another vessel carrying Saitô Bettô Sanemori, a Heike general, approaches and Sanemori calls his greetings to Munemori. Munemori and Saemon invite Sanemori on board their own boat and the three exchange cups of sake. While they are drinking, Sanemori notices a young woman swimming toward them but on the point of exhaustion and likely to drown. With the aid of the sailors Sanemori catches her and draws her on board. When she can recover her voice the girl thanks her rescuers and says that her name is Koman. This means nothing to Sanemori, but when he reveals his own identity as one of the Heike clansmen, Koman, an ardent supporter of the Genji Clan, is desperate at finding hers elf in the hands of her enemies. In fact, she was escaping from some other Heike clansmen when rescued by Sanemori and now her pursuers come up to the boat in their own small craft. They call to Munemori that she escaped from them when they tried to wrest from her the white banner of the Genji, which, tightly furled, she still has in her hand. Saemon turns quickly and tries to take the banner but Koman holds it high above her head, determined that it shall never fall into enemy hands. Sanemori slashes at her with his sword and her severed arm, still clutching the banner, falls into the waters of the lake, followed by the lifeless body of the noble girl. --> A dedicated summary: "Sanemori Monogatari"
Koman's adoptive parents, Kurosuke and Koyoshi, and her son Tarokichi live at Onohara village near Lake Biwa where Koman has just died in defense of the banner of the Genji Clan. Kurosuke and his wife are also devoted to the cause of the Genji clan. Koyoshi is spinning cotton thread on his watakuri and Kurosuke is away fishing together with Tarokichi. Nisôta, Kurosuke's nephew, enters and begins to question Koyoshi on the presence in the house of a woman whom Kurosuke has recently brought to Onohara from Kyôto. Nisôta says he believes the woman to be Lady Aoi Gozen, widow of the late Genji general, Minamoto no Yoshikata. Koyoshi knows that this is the true identity of the woman but, knowing that Nisôta may betray her, tells him that he is talking nonsense and that the woman is simply a mistress of her husband's whom he has got with child and brought to his house so that it may be delivered safely. Nisôta laughs at this story and leaves, saying he is sure that the stranger is really Aoi Gozen. When Nisôta has gone Aoi Gozen appears. She is, in fact, pregnant with the child of her late husband and her time is very near. She asks whether Koman has yet returned home, and a moment later Kurosuke returns from his fishing together with Tarokichi. Tarokichi is excited at a strange catch they have made and shows his grandmother a woman's severed arm wrapped in the fishing net. The arm is, of course, that of Koman and the furled Genji banner is still tightly clasped in the dead hand. Both old Kurosuke and Aoi Gozen try to prize the banner from the rigid fingers but in vain. However, when Tarokichi makes an attempt the fingers open immediately and the banner is released. Aoi Gozen now can recognize it as the Genji banner, long a treasure of her family and simultaneously she, together with the farmer and his wife, realizes that the arm must be that of Koman and that she has died to save it. The two Heike warriors who now appear are Saitô Bettô Sanemori  (the man who cut off Koman's arm) and Senoo Jûrô Kaneuji. Nisôta has, after all, betrayed Aoi Gozen to them and Senoo tells Kurosuke that concealment is useless. Sanemori adds that their mission is not to kill Aoi Gozen but they have been ordered to kill all men, boys or even male babies of the leaders of the Genji. Believing the baby to have already been born, they demand to see whether it is a boy or a girl. Kurosuke begs them to leave Aoi Gozen in peace a little longer. Senoo refuses to hear Kurosuke's pleas and says that if the child is not yet born then he is ordered to kill the mother and Sanemori is to check the child yet within her. Kurosuke is horrified at the thought of such butchery but before he can plead further Koyoshi calls from within that Aoi Gozen is now delivering her child. Kurosuke moves to join his wife but is prevented by Senoo. Koyoshi enters carrying a bundle wrapped in brocade. Kurosuke in anguish asks if it is a boy and when Koyoshi does not answer Senoo tells her to take it to Sanemori who is charged with the infant's death if it be male. Koyoshi silently obeys. When Sanemori unfolds the wrapper, he is astounded to find in it a human arm! Senoo is incredulous and furious at what he takes to be blatant deception. Koyoshi, however, maintains with tears that Aoi Gozen has in fact been delivered of this monstrous birth, and she receives unexpected support from Sanemori. He refers to the Chinese princess who, having clasped, during her pregnancy in the heat of summer, an iron pillar in the palace to cool herself, was delivered not of a child but an iron ball. Presumably Aoi Gozen has had much massage during her own pregnancy and, by analogy, has now been delivered of an arm. Sanemori says that he is so convinced of the truth of Koyoshi's story of the birth that Onohara village shall henceforth be known as Teharami-mura (literally, Arm Delivery Village). Senoo cannot understand why Sanemori should be so credulous and leaves, saying that he will report the whole matter and that Sanemori must bear the responsibility. His own doubts yet remain and though he pretends to hurry away from the house Senoo hides in a grove nearby to watch what happens when the family feels free of his presence. Inside the house Aoi Gozen appears to thank Sanemori for his mysterious support of their desperate plan which they thought had so slim a chance of success. Sanemori reveals that he was originally a Genji man but that for several reasons he has had to fight on the Heike side during the war. He says he is sure that the arm is the one he himself severed from the woman he saved from drowning in Lake Biwa, but at that time she had held a white banner. Aoi Gozen says that she now holds that banner. Kurosuke and Koyoshi cry out again the murder of their adopted daughter and Tarokichi learns with shock of his mother's death. Sanemori now tells them all that happened on the boat and how the noble Koman met her death. When Koman declared that she would die rather than let the enemies of her clan take the banner with which all prospects of Genji fortunes were bound up, Sanemori, torn between his present allegiance to the Heike and his old bond to the Genji, struck off her arm so that the banner might never be held by his own side and so bring about the downfall of the Genji. It can now be understood why it was that only for Tarokichi, her own son, would Koman's dead fingers open to release the white banner. Some fishermen bear in the body of Koman which they have found on the shore. To dignify the mutilated corpse Sanemori places the banner once again in the hand of the severed arm and places the arm against Koman's body. Miraculously the body and arm are reunited and life comes back to the corpse. In a faint voice Koman asks if the banner is safe. Aoi Gozen reassures her that it was preserved from the Heike and Koman begins to say something meant for Tarokichi. But before she can tell him what she wishes Koman falls back, lifeless. Kurosuke, however, is able to reveal what he knows she wished to say. Tarokichi must now know that Koman is not the real daughter of Kurosuke and Koyoshi but was found as a baby by them abandoned on the shore of the lake. The only evidence of her identity was a small dagger and a letter which named her as a child of the Heike Clan. Kurosuke, however, has brought her up as his own daughter, owning, as he does, allegiance to the Genji. Aoi Gozen now cries out, for her time is coming and Koyoshi assists her into another room. Sanemori raises the white Genji banner so that the child may be born in a declared house of his clan. The baby is a boy and Kurosuke asks Sanemori to recognize Tarokichi as the retainer of Komawakamaru  as the baby is named. Sanemori agrees to this and gives Tarokichi a new name to mark his rise in status to a samurai. The new name is Tezuka Tarô Mitsumori. He says that the boy will grow to defend his lord and his lord's cause as nobly as did Koman defend the sacred Genji banner against its foes. Aoi Gozen, however, says that though all else recommends Tarokichi as the retainer of her son the fact remains that his mother, Koman, on the evidence of the letter found on her as a baby, was born an enemy of the Genji. Tarokichi must perform some deed that will show clearly that his sympathies are not in the slightest degree affected by his mother's birth. Sanemori realizes that assurance of absolute fidelity is essential when the new young lord is so beset with enemies and agrees that recognition of Tarokichi's service must be delayed. Senoo has heard all that has passed and his suspicions are confirmed. He enters to accuse Sanemori of treachery and, kicking Koman's body out of the way, declares that he will kill Aoi Gozen's baby himself. Tarokichi, seeing his mother's body defiled and his new young lord threatened, seizes the dagger which Koman had carried and stabs Senoo. Senoo collapses and calls out that Tarokichi has now killed a Heike man and can claim to have passed the test of loyalty Aoi Gozen sought to impose. He reveals that Koman was in fact his daughter he abandoned soon after her birth and the dagger with which he has been stabbed by his own grandson is his own dagger. Having heard all that has befallen, Senoo reveals that he deliberately allowed himself to be stabbed by his own grandson so that Tarokichi might claim the honor of serving under Komawakamaru. He then draws his sword and cuts off his own head by holding the blade across the back of his neck. Tarokichi now says that as a samurai he must also avenge his mother by slaying Sanemori, who caused her death. Sanemori says that Tarokichi is too young to take his revenge yet but promises the boy that if he will fight with his lord against the Heike when he grows up, Sanemori, who must remain with the Heike in spite of his ties with the Genji, will give him a chance to avenge in battle the death of Koman. Sanemori mounts his horse (uma) and is about to leave when Nisôta, the man who betrayed Aoi Gozen, appears from his hiding and says he will report their treason to the Heike headquarters. As he begins to run off, Sanemori throws after him a hooked rope and kills him. Sanemori rides off, leaving the triumphant Tarokichi, still a boy in spite of his newly won dignity as a samurai, to mount Koyoshi's spinning frame as though it were a horse and to pose with his mother's dagger in imitation of the martial valor of the warrior he hopes to be. Matsunami Kengyô, a blind biwa music expert, who is on his way to the Toba Detached Palace to entertain the Retired Emperor Goshirakawa, who is confined there, is attacked by Tanigawa Reisui, a highway robber, at the Otowa hill behind the Kiyomizu Temple in Kyôto. Reisui deprives the musician of his clothes and stabs him to death. Then he is killed with a dirk thrown at him by Tada Yukitsuna, a warrior of the Genji Clan. Yukitsuna puts on Matsunami Kengyô's clothes to disguise himself as the blind musician and proceeds to the Toba detached palace in his place. Nanba Rokurô Tsunetoshi, a Heike warrior, tries to attack him but is repelled by Yukitsuna. As Yukitsuna visits the Toba detached palace, pretending to be Matsunami Kengyo, his daughter Kozakura, who is working in the palace as a maid, comes to see him and tells him that her mother Matsuyoi, who also used to be a maid, was killed when she attempted to kill Kiyomori, head of the Heike Clan, who is confining the Retired Emperor. Kozakura, who was also asked by her father to kill Kiyomori, reports to him that there has been no opportunity carry it out. They go to an inner room when they notice the approach of people. Three servants enter and, breaking branches off maple trees in the garden, burn the fallen leaves to warm themselves. The tsubone Wakaba comes to warn them that they may be scolded for their unruly conduct. Flabbergasted, they begin to extinguish the fire when Momiji, another tsubone, appears and, saying that the Retired Emperor is impressed with their literary taste, gives them the Retired Emperor's present of sake (There is a famous phrase in a Chinese poem reading "burn crimson leaves to warm wine in a forest"). With sake flowing in abundance, the servants make merry. When Kozakura comes to show them a strip of paper carrying a poem composed by the Retired Emperor, one of them named Heiji asks her whether her father is Tada Yukitsuna. As she refuses to reply, Heiji ties her to a tree and begins to torture her (semeba). The false Matsunami appears but refrains from helping her as he is afraid of having his identity known. When Heiji tells him to play the biwa he obeys his order. As Heiji intensifies the torture, the false Matsunami is compelled to rush to Kozakura's side to console her. Heiji, who is in fact Nanba Rokurô Tsunetoshi, takes out his sword concealed in his cane and attacks the false Matsunami, saying that he knows his true identity. Yukitsuna hits him back and runs away, taking Kozakura with him. Two other servants, Matagorô and Tôsaku, who are in fact the Heike warriors Ecchû Jirô Moritsugu and Kazusa Gorobê Tadamitsu, come to join Rokurô, carring their respective weapons. On the Momiji hill in the compound of the Toba detached palace Yukitsuna fights off Heike warriors trying to arrest him. An arrow then comes flying and pierces the left sleeve of his kimono. The archer, who proves to be Taira no Shigemori, son of Taira no Kiyomori, appears, accompanied by Nanba Rokurô Tsunetoshi, Ecchû Jirô Moritsugu and Kazusa Gorobê Tadamitsu, and tells Yukitsuna that he is returning the arrow shot at Shigemori by Yukitsuna and failed to hit him several years ago. Shigemori says that this time he deliberately avoided harming Yukitsuna. They promise to meet again later on the battlefield. scenes from Act I or Act IV were occasionally staged before WWII. After WWII and up to nowadays, if we put aside the 1980 revival directed by Ichikawa Ennosuke III, only Act II and Act III (mainly scene 4, scene 2 and scene 3 are rarely staged) are staged nowadays. Act IV might be revived in the future to come at the National Theatre. The "Nunobiki" and "Momijiyama" twin scenes were revived by Ichikawa Ennosuke III in October 1980 at the Sunshine Theater in Tôkyô. The latter scene was entitled "Tôge" ("At the Mountain Pass"). This scene fell into oblivion long time ago. Almost no hope of any revival. Two different sets of kata for the role of Saitô Bettô Sanemori are used nowadays: Onoe Kikugorô V's kata and Ichikawa Danzô VII's kata. Onoe Kikugorô V's kata were based on kata created by Bandô Mitsugorô III and transmitted to Onoe Kikugorô V through Bandô Hikosaburô V. Onoe Kikugorô V's kata were used by Ichimura Uzaemon XV and Ichikawa Danjûrô XI. Ichikawa Danzô VII's kata came from Kamigata, where the actor learnt them from Arashi Mitsugorô. Ichikawa Danzô VII's kata were used by Nakamura Kichiemon I. This little boy is the future warrior Minamoto Kiso Yoshinaka. Act IV was completely revised for the Bunraku staging of "Genpei Nunobiki no Taki" in the 3rd lunar month of 1825 in Ôsaka at the Inari Shrine. The biwa torture scene (semeba) was such a success that it led to the integration of the new fourth act to definitively replace the old one. Moreover, it was used to create the Kabuki kagekiyomono "Biwa no Kagekiyo" which was written by Kawatake Shinshichi II, entitled "Arigataya Oedo no Kagekiyo" and premiered in the 3rd lunar month of 1850 at the Kawarasakiza. In "Biwa no Kagekiyo", Matsunami and his daughter Kozakura were replaced by Kagekiyo and his daughter Hitomaru.